« What’s More Important, Monopoly Privileges for Union Bosses or Educational Opportunity for Minority Children? What Do Greece, the United States, and the Cayman Islands Have in Common? At first, this seems like a trick question. After all, the Cayman Islands are a fiscal paradise, with no personal income tax, no corporate income tax, no capital gains tax, and no death tax. By contrast, Greece is a bankrupt, high-tax welfare state, and the United States sooner or later will suffer the same fate because of misguided entitlement programs. But even though there are some important differences, all three of these jurisdictions share a common characteristic in that they face fiscal troubles because government spending has been growing faster than economic output. I’ve written before that the definition of good fiscal policy is for the private sector to grow faster than the government. 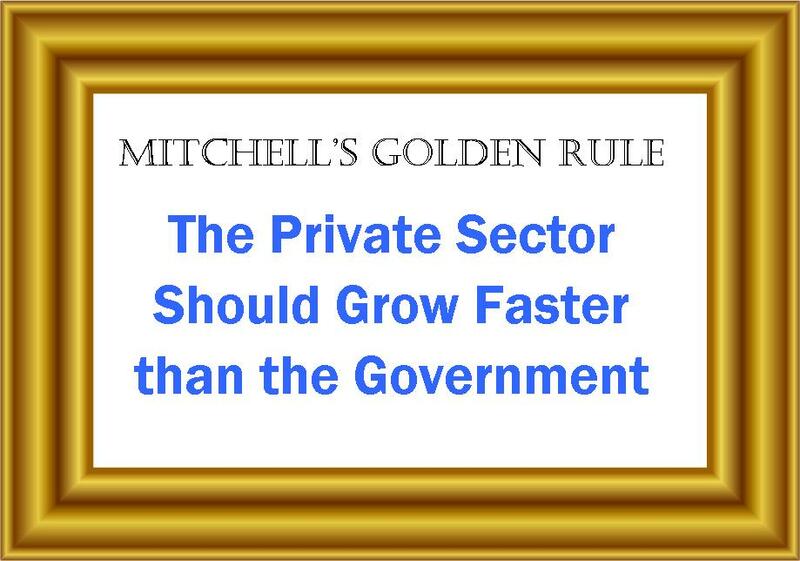 I’ve humbly decided to refer to this simple principle as Mitchell’s Golden Rule, and have pointed out that bad things happen when governments violate this common-sense guideline. In the case of the Cayman Islands, the “bad thing” is that the government is proposing to levy an income tax, which would be akin to committing fiscal suicide. The Cayman Islands are one of the world’s richest jurisdictions (more prosperous than the United States according to the latest World Bank data), in part because there are no tax penalties on income and production. So why are the local politicians considering a plan to kill the goose that lays the golden eggs? For the simple reason that they have been promiscuous in spending other people’s money. This chart shows that the burden of government spending in the Cayman Islands has climbed twice as fast as economic output since 2000. Much of this spending has been to employ and over-compensate a bloated civil service (in this respect, Cayman is sort of a Caribbean version of California). In other words, the economic problem is that there has been too much spending, and the political problem is that politicians have been trying to buy votes by padding government payrolls (a problem that also exists in America). The politicians claim the tax will only be 10 percent and will only be imposed on the expat community. But it’s worth noting that the U.S. income tax began in 1913 with a top rate of only 7 percent and it affected less than 1 percent of the population. But that supposedly benign tax has since become a monstrous internal revenue code that plagues the nation today. Except the results will be even worse in Cayman because the thousands of foreigners who are being targeted easily can shift their operations to other zero-income tax jurisdictions such as Bermuda, Monaco, or the Bahamas. Or they can decide that to set up shop in places such as Hong Kong and Singapore, which have very modest income tax burdens (and the ability to out-compete Cayman in other areas). As a long-time admirer of the Cayman Islands, I desperately hope the government will reconsider this dangerous step. The world already has lots of examples of nations that are following bad policy. We need a few places that are at least being semi-sensible. By they way, I started this post with a rhetorical question about the similarities of Greece, the United States, and the Cayman Islands. Let’s elaborate on the answer. Here’s a post that shows how Greece’s fiscal nightmare developed. 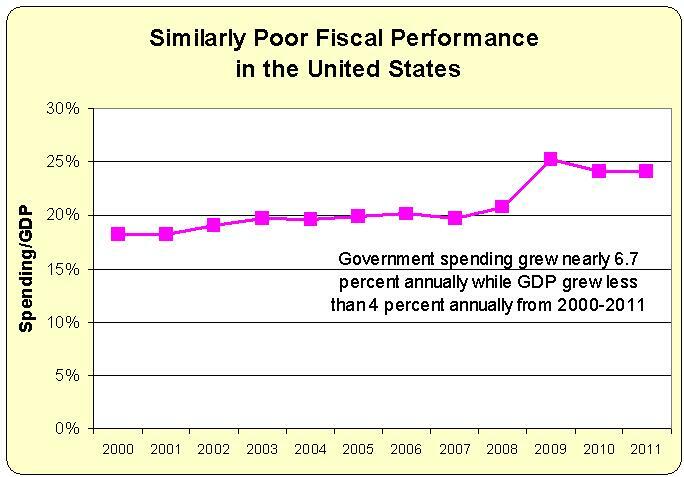 But let’s show a separate chart for the burden of federal spending in the United States. 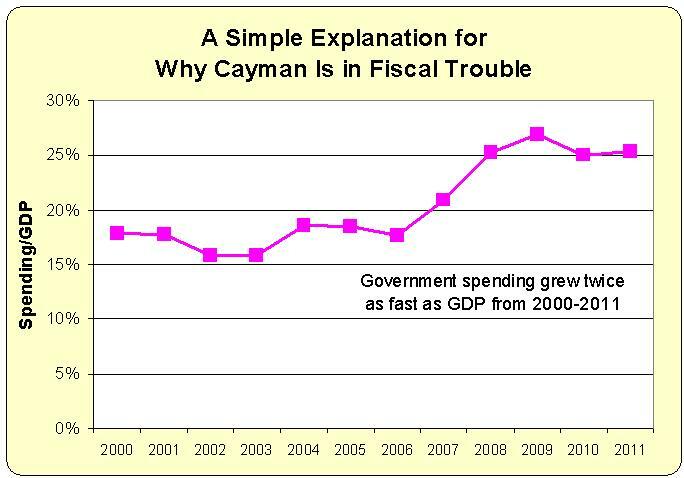 What’s remarkable is that the federal government and the Cayman Islands government have followed very similar paths to fiscal trouble. Indeed, Caymanian politicians have achieved the dubious distinction of increasing the burden of government spending at a faster rate than even Bush and Obama. No mean feat. This data for the U.S. chart doesn’t include the burden of state and local government spending, so the Cayman Islands still has an advantage over the United States, but I’ll close with a prediction. If the Cayman Islands adopts an income tax – regardless of whether they call it a community enhancement fee (to misquote Shakespeare, a rotting fish on the beach by any other name would still smell like crap), it will be just a matter of time before the burden of government spending becomes even more onerous and Cayman loses its allure and drops from being one of the world’s 10-richest jurisdictions. Which will be very sad since I’ll now have to find a different place to go when America suffers its Greek-style fiscal collapse. Great article. For British expats in the Caymans, you can also avoid 55% tax upon death and UK income taxes of up to 50%. A very interesting and appropriate piece to show Jamaicans the dangers of more government spending.